Civil Registry Office, along with the Wedding Application and they will not be returned. As specified above, your birth certificates are only necessary if you want your parent’s names printed on the marriage certificate. is legally recognized in Mexico and in the 60 other countries around the world that are subscribed to an international treaty under the Hague Convention. 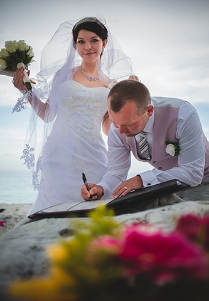 legally married in Cancun or the Riviera Maya. Provide you with detailed required information for the wedding application form. Fill out the wedding application form, according with the information you provide. Submit the wedding application form, blood test and medical certificates to the court. Provide you with all paperwork, government forms, copies of documents etc. Booking the judge for the date and hour of your choice. Make appointment for Lab to have tests done. Pick you up at your resort, drive you to the lab, and drop you back off. Have you Marriage Certificate to be apostilled at the state capital. Obtain a certified copy of your marriage certificate. Mail the Wedding Certificate to your country and home address. Provide your wedding witnesses if you don't bring your own. Who can Legally Marry People in Mexico? Celebrate your Wedding Anniversary, on ONE DAY! mind at ease, and enjoy your time before the wedding. Please Scroll Down to the bottom of this page to Download the complete list of Requirements and Legal Fees for a Civil Wedding in Cancun!